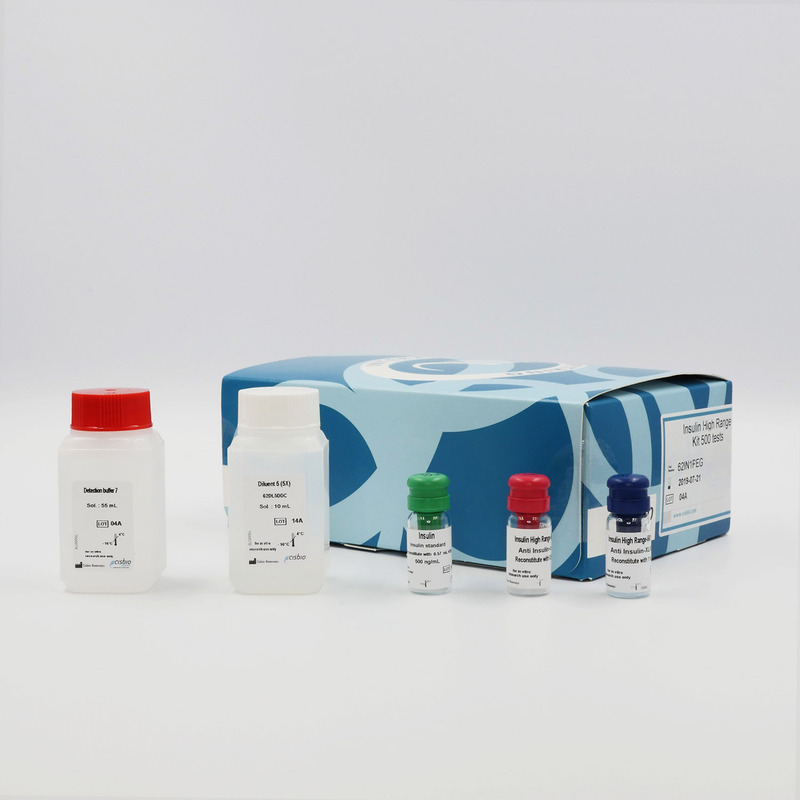 The Insulin High range kit is specifically intended to quantify insulin in highly concentrated samples of cell supernatant without performing dilution steps. A must have in diabetes research! Highly concentrated samples often need to be diluted prior to insulin being quantified in an assay. With no washing steps and a 4 log dynamic range, this HTRF High Range kit delivers on the promises of lower sample dilution and increased accuracy for a straightforward and reliable quantification of insulin. Insulin is measured using a sandwich immunoassay with two monoclonal antibodies, one labelled with Cryptate (donor) and the other with XL665 (acceptor). The intensity of the FRET signal obtained is proportional to the concentration of insulin in the sample. 5 µL of cell supernatants are supplemented with 50 µL of acceptor-labelled antibodies and 25 µL of donor-labelled antibodies (or 75 µL of pre-mixed reagents for a single dispensing step). The mix is then incubated from 4h to overnight at RT and results are read on an HTRF compatible reader. The HTRF High Range insulin assay showed an excellent correlation to the leading RIA on human pancreatic islet supernatants. With a slope of 0.9, the regression line was close to the ideal line, demonstrating the assay's reliability. MIN6 mouse ß-cells and INS-1E rat ß-cells were seeded in 24-well plates (400,000 cells/well in 500 µL medium), then cultured for 6 days in complete culture medium at 37°C - 5% CO2. Before stimulation, cells were washed with KRB buffer and a cellular quiescence step was performed in KRB buffer (without glucose) for 2 hours at 37°C. Cells were stimulated with 250 µL of KRB buffer solutions containing increasing concentrations of glucose. After 10 and 30 minutes of secretion for MIN6 cells, or 2 hours of secretion for INS-1E cells, cell supernatants* were collected and insulin was quantified using HTRF detection reagents. Each condition of treatment was measured in triplicate (error bars represent SEM). ​* Samples were kindly provided by S. Dalle and M. Ravier’s research team: Physiopathology of pancreatic beta-cells, IGF, Montpellier, France. Freshly isolated pancreatic islets from a male Wistar rat were incubated at 37°C for 30 min in KRB buffer containing either 2.8 mM glucose (non-stimulant basal condition) or 8.3 mM glucose (stimulant condition) (5 islets/tube;4 tubes/condition). At the end of the incubation period, supernatants* were collected and the insulin concentration determined using the Insulin High Range kit reagents. A pancreas isolated from a male Wistar rat was perfused with KRB buffer containing 1.5 g/L glucose +/- 10 µM Quercetin. The medium was continuously bubbled with 95% O2 ± 5% CO2 and maintained at 37.5°C. A constant pressure was selected to give a flow rate of between 2.5 and 3.3 mL/min. The efferent fluid* was collected over time (13 fractions), and insulin concentration was measured using the kit reagents. Pancreatic islets from 3 human pancreases (A, B and C) were placed in 24-well plates (50 islets/well, 3 wells/condition) and pre-incubated for 1h at 37°C in KRBH buffer containing 2.8 mM glucose. The incubation was prolonged for one hour and the supernatant was collected to measure basal insulin secretion. The islets were next stimulated for 1h at 37°C with 16.7 mM glucose before collecting the supernatant to measure glucose-stimulated insulin secretion. The islets were then lysed with a solution of acid-ethanol for 24h and the lysate was collected and centrifuged. The insulin in supernatants* and lysates* was quantified using the Insulin High Range kit reagents. ​* Samples were generated at the Laboratory of Cell Therapy for Diabetes, Institute for Regenerative Medicine and Biotherapy (IRMB), Montpellier University Hospital, France.